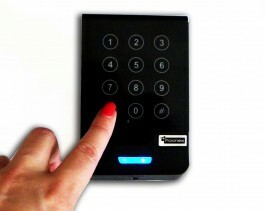 Contactless RFID reader with built in sensor keyboard. Extremely elegant and beautiful design. The buttons have special covering and no mechanical elements which guarantee 0% abrasion. Ability to work with RFID card, PIN code and combination between these two methods. The reader supports standard communication protocol which is compatible with most of the controllers. It is waterproof and is suitable for outdoor installation. Very convenient to work in darkness thanks to the powerful blue led which lights all the buttons. This reader is suitable for lot of access control systems in different buildings like residential and administrative buildings. Ability to use work codes to generate an event which informs you where have your employees been during the work day. Also a special feature is its compatibility with user cards of the public transport in Sofia. This means that users of the new access control system can use their own transport cards which is for the bus, train and others.